Shadyside Presbyterian Church offers a Grief Support Group designed to provide encouragement and a faith-centered perspective for those who have lost a loved one. The group meets regularly to discuss a variety of subjects that are important in the grief recovery process, including the range of emotions which grief brings, and resources for moving forward. Sessions are led by a pastor or grief counselor and an experienced grief support facilitator. New participants are always welcome to join at any time; there is no cost to attend the group, which is a ministry sponsored by the Board of Deacons. For more information about upcoming gatherings of the Grief Support Group, contact Rev. Lynn Portz. 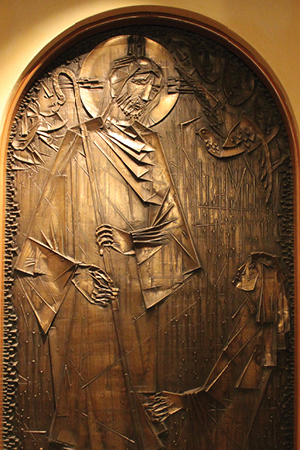 Image (right): Detail of a brass bas-relief sculpture by Virgil Cantini, which is the centerpiece of the Columbarium at Shadyside Presbyterian Church. Dedicated to Shadyside physician W.D. Richards, the artwork depicts the woman who touched the hem of Christ’s garment and was healed (Luke 8:43-48).